I first heard about The Publican a few months ago through another foodie, who had an amazing meal there. She raved to me about how fantastic their freshly shucked oysters were and how their spicy pork rinds were some of the best she has ever had. The review really caught my attention, and I just had to find an opportunity to go. This opportunity presented itself a few weeks ago when one of my friends decided to bring a large group of us to The Publican for his birthday dinner. Twelve of us went out for our 10 pm reservation on a Saturday night and arrived in various groups ranging from ten to twenty minutes late. The hostess was incredibly accommodating, and we waited at the bar while the rest of our group slowly trickled in. At the bar, a few of us ordered some beers. Something that immediately impressed me was that The Publican had one of the largest selections of craft and specialty beers I had seen at any restaurant. From Belgian beer made by monks to craft farmhouse ales from the Chicago area, they had a beer for every taste and situation. One of my friends accidentally ordered a $38 beer, and the bartender went out of his way to make sure that my friend knew what he ordered before he opened the beer and charged us for it. My friend, slightly embarrassed but incredibly thankful, chose a different beer instead. Once the whole party arrived, they seated us at one of the many wooden banquet tables. These long tables, with no true break in between different dining parties, truly contributed to the welcoming atmosphere that The Publican had. The waitress explained to us the family-style ordering system that they had, and we decided to just order a large amount of different entrées and share them. We started out with some of the freshly shucked oysters and were thoroughly impressed. They had the classics such as Wellfleet oysters, and some more unique, small stock oysters. My favorite of these was the Blue Pool oyster, which I can legitimately say was one of the best oysters I have ever had. After this, a few of us got the raw razor clams, which was a completely new experience for me. They were chewy, but not in a bad way, with the consistency of perfectly cooked octopus. After the raw oysters and clams, the entrées started to come out, with the waitress announcing the components of each dish before serving it. 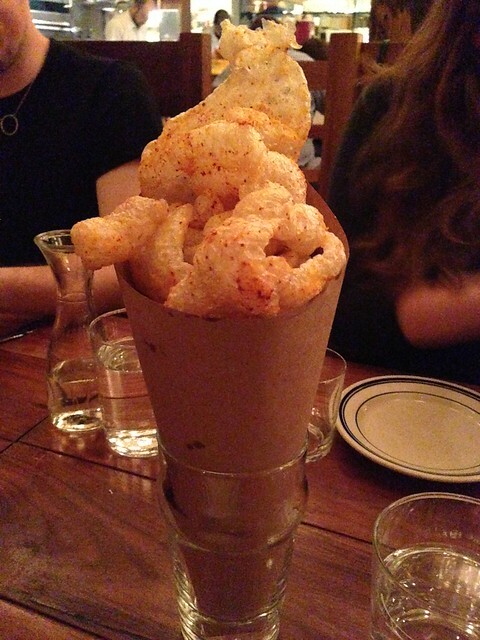 The first item to come out was the spicy pork rinds. Incredibly light and airy, these chip-like snacks were truly brought to the next level by the spicy topping. Fortunately, the waiter put the cone filled with the pork rinds directly next to me, so I was able to snack on them to my heart’s content. From the gorgeous chicken liver pâté on fresh country bread to pan-braised broccoli with a spicy peanut sauce, The Publican showed true mastery in a variety of dishes. 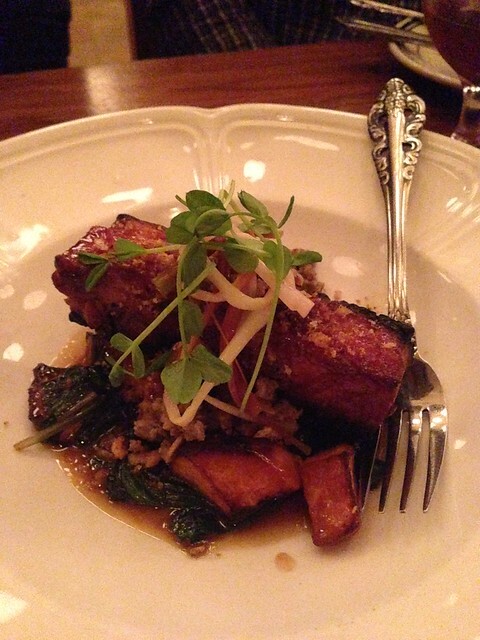 By far, though, my favorite dishes were the seared ramps, followed by the braised pork belly. The seared ramps were shockingly fresh and served over a bed of creamy baked sweet potatoes to create a light but flavor-packed dish. The braised pork belly was clearly the star of the meal, with a crisp sear on top but fork-tender throughout. As we ended out our meal, very late into the night, the waitress came over and made sure that we had everything that we wanted before they closed the kitchen. We ordered some phenomenal French press coffee and hung out as the restaurant began to close. At no point in our meal did we feel rushed or unwelcome, which was a great feeling for a large group of college students. The Publican was wonderfully welcoming and served truly delicious food. Their warm professionalism helped to make it a sincerely memorable night. Because of that, I know where I will be going back to when it is time for my birthday dinner.